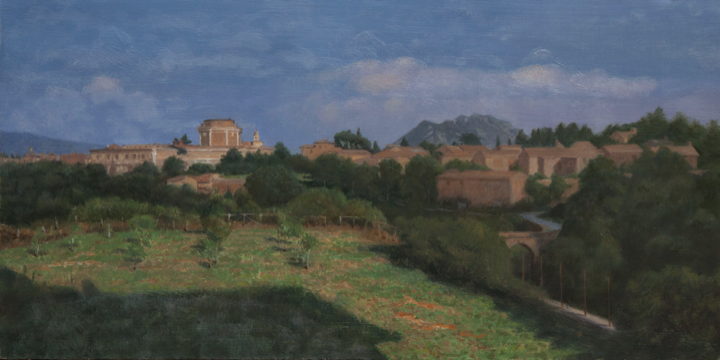 This plein air oil sketch is a view from Villa Bianca, the house from which Corot painted his famous views of Civita Castellana. I completed it later in the studio a short disatnce from the house on the via Terrano. I painted this when I was part of the Italian summer programme of the Jerusalem Studio School, under the direction of Israel Hershberg. A very cautious elderly owner allowed me on to the first floor balcony here to paint the view of Fort Sangallo and the town. Corot actually painted from the top bedroom window two storeys higher, but that was a step too far to afford this Irish random caller with no Italian. The shadow of the house is in the foreground. The bridge crosses one of Civita Castellana's characteristic deep gorges which drew painters on the Grand Tour to the town.